John Tamny, that’s who. (See the 15-second video below.) John is a fellow at the Cato Institute, the editor of RealClearMarkets, frequently contributor to Fox Business, and a columnist for Forbes. 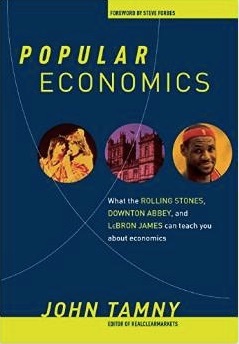 He’s also the author of a book coming out next month, Popular Economics: What the Rolling Stones, Downton Abbey, and LeBron James Can Teach You About Economics. I’m enjoying the galleys right now, and although it doesn’t come out officially until April 13 (just in time for tax day! ), you can pre-order at Amazon today, of course. The problem for the oil industry is that falling oil prices have little to do with production efficiencies, and a lot to do with a stronger dollar that has exposed a great deal of economic activity in the oil patch as non-economic. Once again, a monetary subsidy expanded an oil-patch occupation at the expense of others, but with the subsidy having partially vanished, the energy occupation no longer makes sense to the extent that it did. To put it as plainly as possible, there was never an oil supply problem in the ‘2000s that needed fixing.